When I arrive, I greeted by a very clean and well-kept facility. Outside, two doors down, one can buy live poultry (hey, it's the Bronx), but here, in the school, the mats and equipment are pristine. The place was previously a rundown karate school, Sensei Iglesias tells me. 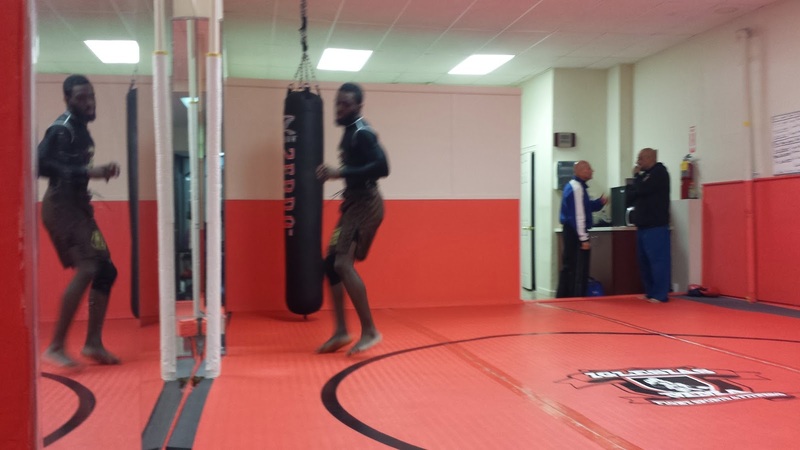 But they fixed it up, and opened their doors to full-fledged MMA instruction on January 26 of last year. One by one the students make their entrance, and I watch them warm up. It's pretty much your typical judo class, complete with randori. Of course, Jerome isn't your typical novice athlete. He may not be a deep well of judo knowledge, but he moves like.. well, someone who's had to fight against trained fighters quite a bit. Eventually, the judo portion of the class ends, and the apparel switches from gis to fight shorts and rashguards. Waiting in the wings is Victor, the boxing coach on staff. He'll get his turn with Jerome in a bit. 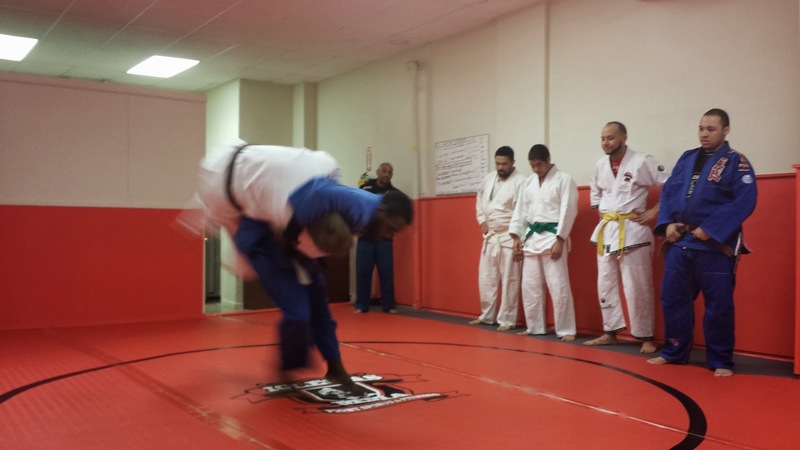 A few of the students will be competing at an upcoming judo tournament, but Jerome's fight - which will be the main event of the NYFE show - that's a different beast entirely, and that beast needs to be fed. When there's a lull in the training session, I grab Jerome and ask him how he found this place. He tells me how one of his sponsors pointed him in this direction. He also describes his routine, which involves training four days a week here, all the while juggling his day job as a cook in a restaurant. I ask if he feels pressure, being undefeated and the defending champ. "There's always pressure, because when you're undefeated, a lot of guys worry about being undefeated. I know it's a reality as a fighter that I'm going in there with the object of me making him lose. I sustain the same type of damage, I can receive the same type of treatment. So I don't really worry about the record - a record is just a record. It is what it is. You win some, you lose some. But the goal is to try to win as many as you can without losing too many. If I lose, I lose. 'It's a bad attitude,' some people say, but I'm a realist. It's fighting. It's a hurt game." I speak with Sensei Iglesias as well, asking about his background and what he thinks about MMA. An ex-Marine and Vietnam veteran, he's spent over 50 years in the martial arts, and has black belts in Goju-Ryu Karate, judo and the Hayastan Grappling System. He's also a certified instructor in Gracie Jiu-Jitsu - which ultimately means he digs mixed martial arts. Digs it a lot. In November, when the UFC released their revised fiscal projections on impact sanctioned MMA would have on New York's economy, and they included revenue estimates new UFC-branded gyms would bring in. But they failed to consider the "X" factor of small mom-and-pop gyms - gyms like Iglesias MMA, which are now sprouting up because there's a need for them. This is the new world we New Yorkers live in. There were around 50 amateur MMA shows in New York State last year, and not everyone who fought on those cards came from the gyms owned by Renzo Gracie, Matt Serra, Ray Longo and Tiger Schulmann. I say goodbye after watching Jerome train for a couple hours, and make my way back home.